Why was the fellowship created? Jennifer Maxwell created the Brian Maxwell Fellows at the Haas School of Business in 2006 to commemorate her late husband Brian, PowerBar co-founder. Brian had an insatiable entrepreneurial spirit and created opportunities throughout his meaningful, but short life of 51 years. Through the creation of the fellowship, Jennifer wants to make it possible for graduate students with a dream and the drive to “go for it,” to create opportunities, to innovate and bring real value and change to the world. What is Jennifer’s vision for the Brian Maxwell Fellows? Jennifer encourages each Brian Maxwell Fellow to “conquer yourself, live your passions, innovate and make a difference.” She envisions a collaborative group of like-minded individuals aspiring to embody Brian’s insatiable desire for innovation and creativity. Jennifer sees the Fellows pursuing their passions and dreams with the goal of creating opportunities, innovating and bettering the world. To capture and perpetuate some of the will and drive that Brian possessed would make the fellowship a success as we aspire to be the nation’s most innovative and leading graduate fellowship program. Each year, the Brian Maxwell Fellows Selection Committee awards up to two graduate fellowships to Haas students based on the same entrepreneurial characteristics that drove Brian to success: determined; persistent; passionate; optimistic; courageous; fearless; strong; creative; generous; humble; and peaceful. He also had will and an enduring belief in people. Who is the contact regarding fellowship admissions and application questions? Financial Aid Office, Finaid@haas.berkeley.edu, 510-643-0183. What does it mean to be a Brian Maxwell Fellow? A Fellow is an innovator and an entrepreneur who embodies the spirit and characteristics of Brian. Graduating from Haas is the first step to commemorate Brian in a lifelong quest for innovation and creativity, achieving the extraordinary, and keeping alive Brian’s entrepreneurial spirit. A Fellow brings change to the world and shares a lifetime of experiences with their constituencies, colleagues, friends and families and with the Brian Maxwell Fellows family. What are the financial benefits of being a Brian Maxwell Fellow while attending Haas? The fellowship provides $40,000 for each of the two years of full-time MBA study. Did Brian and Jennifer attend the University of California Berkeley? Yes. Brian was born in London and grew up in Toronto, Canada. 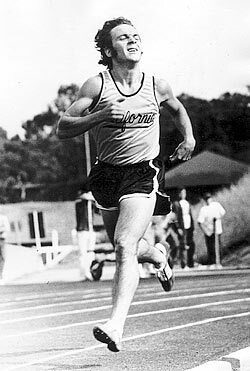 In 1971, Brian accepted a track scholarship to Cal. As a senior, Brian received the Brutus Hamilton Award as the outstanding athlete on the track team. 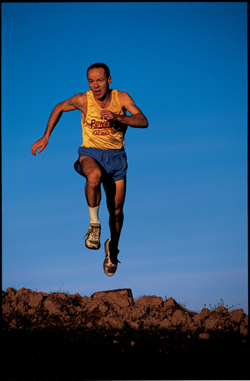 After graduating in 1975 with a degree in architecture, he began training for his first marathon. Jennifer graduated with a degree in nutrition and food science in 1988. Did Brian and Jennifer attend the Haas School of Business? What were some of Brian’s running accomplishments? In 1977, Brian was ranked third in the world in the marathon. Winning a total of 14 marathons, his personal best was 2:14:43. Brian was the top marathoner on the 1980 Canadian Olympic team that boycotted the Moscow Games. Brian served as head coach of the Cal men's cross country team and assistant track coach at this time, during which every distance running record at Cal was shattered. What was one of Brian’s favorite books? “The White Spider: The Story of the North Face of the Eiger” by Heinrich Harrer. What is the PowerBar story? In 1983, Brian started a project to develop a nutritious, easy-to-digest food for athletes. Brian and Jennifer teamed up while she was an accomplished runner and nutrition and food science student at Cal. In 1986, they founded PowerBar Inc. and began selling energy bars out of their kitchen. Many athletes fondly recall Brian and Jennifer handing out samples at local events from the trunk of their 1964 Ford Falcon. Over the next 13 years, with Brian as CEO, PowerBar grew to $150 million in sales and 300 employees. By the time they sold the company to Nestle in 2000, PowerBar was one of the most highly respected sports brands and athletes worldwide had come to rely on the company’s products as essential to their performances. Brian was widely recognized for his innovative, inspirational leadership style and was named "Entrepreneur of the Year" by Inc. and a "Superstar of Marketing" by Advertising Age. Jennifer is an accomplished competitive runner, mother of six children and co-founder of PowerBar with her late husband Brian. Jennifer is widely recognized for her innovative leadership style. In March 2007, she was a keynote speaker at the 11th annual Haas School of Business Women in Leadership Conference. In April 2007, she received the Haas Women in Leadership Cora Jane Flood Philanthropy Award. Jennifer received the inaugural award for her outstanding support to the Haas School of Business through the establishment of the Brian Maxwell Fellows. Throughout Jennifer’s career, she has stressed the importance of maintaining a balance between work and her children. What are some examples of Brian and Jennifer’s generosity? The Maxwells are renowned for philanthropic donations to their alma mater, local organizations and elementary and high schools. The Maxwells' gifts to Cal have included contributions to the Haas Pavilion, the Athletic Department's Academic Study Center, The Bancroft Library, a Faculty Chair in Maternal and Child Health in the School of Public Health, and the Maxwell Family Field. Who is the contact for the Brian Maxwell Fellows? Scott Sowry is the president of the fellowship and can be reached at scott@brianmaxwellfellows.com or 415-686-4903.